The Yorkshire Area season came to a climax on an afternoon that saw Chris Dawson and Jo Foster clinch the respective Yorkshire Area Gentleman and Lady Rider Titles. Fittingly, they each secured a winner on the day to seal top spot. Racegoers had to brave several heavy rain showers, but many took advantage of the free admission due to the generosity of landowner John Wade. Those that ventured out were rewarded with thrills and spills galore. The Hunt Members had a quartet in attendance, of which Persian Prince and John Dawson finished alone. Persian Prince set a very sedate pace as none of the others wanted to blaze the trail, but this was right up his street. He wound things up on the final lap and appeared in command when his three rivals departed at the second last. Persian Prince goes under the hammer at Doncaster Sales next week and it will be difficult to believe that new connections will get more out of him than the three victories this season for his current handler. When he was left solo, the others were under pressure about three lengths down. Saddlers Singer fell, bringing down Crashtown Leader and the favourite Abandon Ship. Abandon Ship lay winded for quite a while, but he thankfully seemed no worse than a bit stiff when he eventually got to his feet. The downhill stretch here doesn’t really play to his strengths. Nine horses came under orders for the Confined over 3m5f. Always Right was the long odds-on favourite despite a welter burden of 13st 1lb and he claimed the spoils by three and a half lengths. It wasn’t plain sailing though and Chris Dawson had to keep him up to his work in the closing stages. Class told at the end of the day and there is no disputing that the gelding is as good as anything that Yorkshire has to offer. This smart customer has only been found wanting in the Cheltenham Foxhunters so far in his career. Allborn Lad ran a cracker in second. Lucinda Sutcliffe was back in the saddle and her handling has impressed me greatly this year. Always to the fore, although he couldn’t stick with the winner, Allborn Lad stayed on stoutly when it mattered. He had looked a bit one-paced over the conventional distance on several occasions, but seemed to relish the step up in trip. 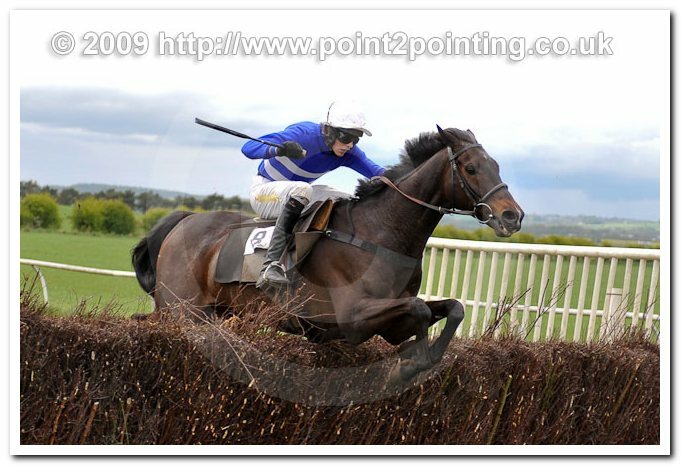 It will be interesting to see how Allborn Lad fares if tried over an extended distance in 2010. Baron Romeo (James Birkbeck) couldn’t improve much on his midfield position and was third. A quirky sort, Baron Romeo has the ability to pick up a confined, but whether he can channel his energies correctly to do so remains to be seen. That said, he was far from disgraced. Bobby Buttons was a never nearer fourth, running on from the back of the field. The 4yo to 7yo Maiden over 2m4f attracted a field of just six. In a stirring finish, Lady Delilah and All Lit Up were locked in combat on the run-in with Lady Delilah prevailing by a short head. Lady Delilah ran on well for John Dawson and gave everything that she had in the cause, digging deep to gain the day. She hadn’t run badly on her visit to the track in April. All Lit Up tried his best under strong, perhaps overenthusiastic, driving at the death from Miles Seston. All Lit Up had been a respectable fourth in what is usually a solid short maiden at Whittington in April. This lesser distance will probably be the target once more. Third-placed Willybegood again improved for Tina Jackson, although he was fighting a losing battle on the downhill run. No match for the front two when the pace quickened, it was another step in the right direction nonetheless. Pingpong in fourth is struggling to make an impact. The four-year-old debutant filly De Vere played up in the paddock and after some delay was eventually mounted on the course. Quite a taking individual, she did lose her rider in the end, but not before she had laid down something to build on for the future. Half a dozen horses lined up for the Mens Open and Tom Greenall got on the board, partnering Network Oscar to victory. 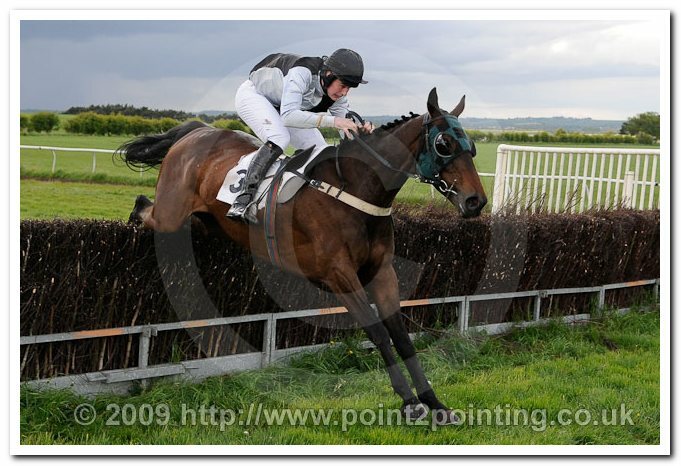 He didn’t get on top until the final fence, but doesn’t strike me as the easiest of rides. Network Oscar is never particularly impressive, but he gets the job done. 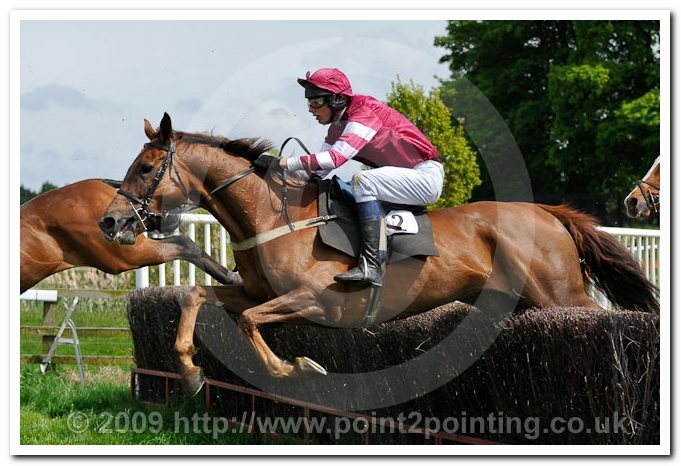 At Whitwell-on-the-Hill in April he trotted up in a weak Grimthorpe Gold Cup. In second, Forty Shakes again found one too good. Chris Dawson did the steering and this fellow has been running well without actually winning. He isn’t quite in the same form as a couple of years ago, but is still a fair performer. Reunited with regular pilot Steve Charlton, Brown’s Beck took third. A top of the ground specialist, he put a below par effort at Easingwold last week behind him, even though they were again making a pretty deep print here. Fourth-placed High Moor had only won a restricted, admittedly at this venue in March, so this was a tough assignment. He was scrubbed along with a circuit to travel. Another making the step up from restricteds, having scored at the April Mordon meeting, was The Viking. 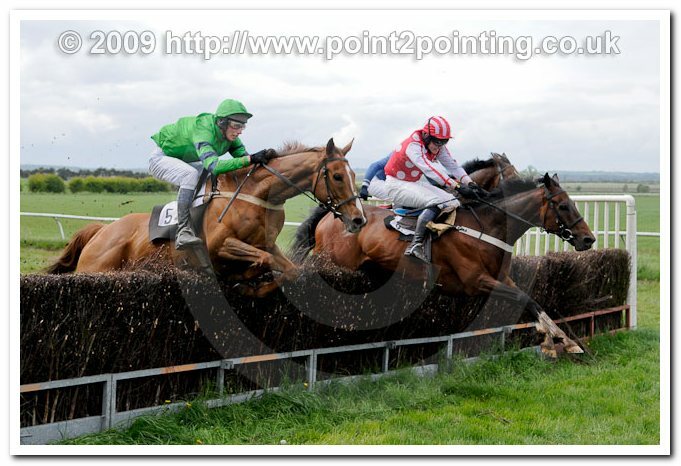 He went off second favourite and had made headway to take closer order when he fell at the penultimate obstacle. The Viking wouldn’t have been far away. The Ladies Open brought together nine hopefuls and On Y Va forged clear on the run-in to collect for Jo Foster. On Y Va moved well throughout and powered down the hill to the judge. 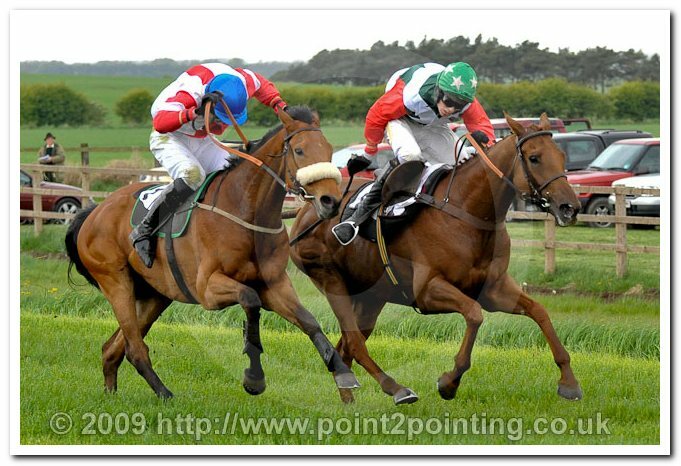 He has put in some sprightly displays this spring, winning at Flagg, prior to an odds-on second at Heslaker. On Y Va can continue to pay his way. Oaklands Luis came second and now appears to need a greater test of stamina. Oaklands Luis was basically done for speed when things got serious. He gets on well with rider Tina Jackson and the partnership had taken a mixed open here in April over 3m5f. Third were One Five Eight and Becky Mason. One Five Eight couldn’t raise his game at the business end and might not be the force of old, but he can still set a reasonable standard. 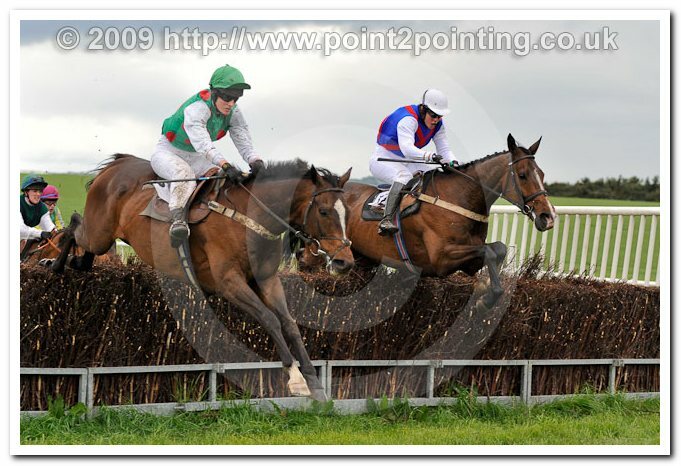 Benwell was left fourth at the final fence. Keeping on from the rear, Ta Ta For Now might just have sneaked a place, but he fell at the last. It might have been one race too many for Delfinia, who couldn’t get involved and has had a long season. Seven of the nine runners in the Restricted had won on one of their previous two outings. Having taken 17 races to get off the mark at Easingwold last week, Knoxhill Archie astounded me by the way he disposed of this lot. Knoxhill Archie had them all in trouble from three out and was mightily impressive. Jockey John Dawson was completing a treble on the card, his first, and didn’t have to get serious with his mount at any stage. 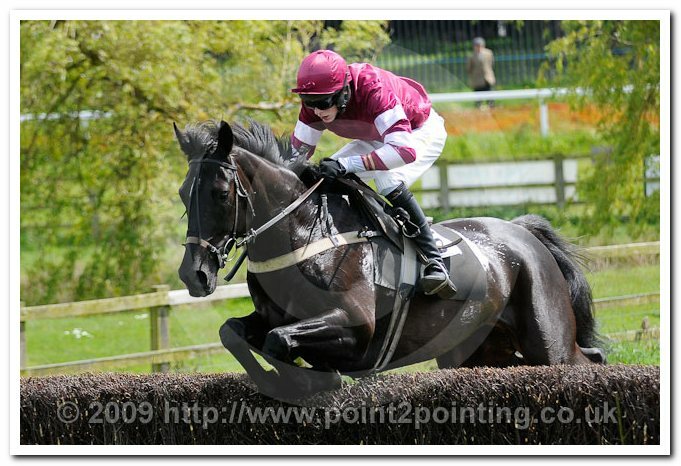 If Knoxhill Archie returns in 2010 in the same sort of mood, he will have more races in him. He may just be a late developer. Areyacoddinmee and Richard Smith were second. A decent stayer, Areyacoddinmee didn’t have the change of gear to go with the winner. He had run a personal best against My Old Piano at Heslaker, but this was a very different test. Racing Ace (Chris Dawson), who had secured his maiden at this venue in April, was a moderate third. He was left behind somewhat easily, however he is less experienced than some of these. He is likely to know more next year. In fourth, Apollo Saturn Five crept into contention, but could only run on at the one pace when the whips were up. Well Worthy found things happening too quickly following his triumph at Heslaker where his undoubted stamina came more into play. The finale was the seven runner Maiden. Desperate Bob was kicked clear by Andrew Glass with four to jump and he drew right away. After he had poached the advantage, he never looked like getting caught. Desperate Bob has run some fair races in defeat and wasn’t winning out of turn by any means. Held up in rear, runner-up Calapocus didn’t jump well for Steve Charlton and was never closer than the eight lengths he was at the finish. Calapocus really should have won one of these on the balance of his form, but again went down on his eighth try. Third came Nina Chester and Lynette Pounder. Nina Chester got outpaced shortly after halfway, but was keeping on when others had cried enough. Meertrix was back in fourth. Opus Star made the running, but beat a hasty retreat exiting the far side. Tabloid was held when pulled up by Tom Greenall in the home straight. And so the curtain was brought down on another exciting season in this part of the world.